The sun is shining, for the third day in a row. You may think I harp on about the weather but in Scotland, the sun shining and the temperature rising above 15C degrees is cause for celebration. What do we think of when someone mentions salad? When I was growing up ‘salad’ meant soft lettuce, tomatoes, cucumber and perhaps a few slices of ham or cheese. No dressing apart from salt. It was probably healthy but it was tasteless. I like salads that are almost meals in themselves. This one includes celery. If you don’t like celery, don’t be put off. Something wonderful happens to it when it is combined with slices of orange. You can’t taste it! The original (as far as I know) orange and celery salad was a simple affair of small pieces of celery and quarters of orange with a dressing of oil and lemon ‘especially good to accompany a terrine of hare or rabbit’ (Elizabeth David in French Country Cooking). It’s refreshing but after peeling the oranges, removing the white pith, I cut them into small pieces about the same size as the celery slices, instead of quartering them. The I dress the salad with a sprinkling of salt, a drizzle of oil and a squeeze of lemon juice. Hugh Fearnley-Whittingstall takes this salad one step further and adds smoked mackerel and although I haven’t tried it yet, it’s on my list. I may also add either slices of red onion or spring onions. In the Middle East, you can make a refreshing salad with peeled and sliced oranges, black olives and thin slices of red onion (no celery). Dressed with oil and lemon, it’s also quick and easy to make. But today I needed something more substantial for lunch. So, after rooting around in the fridge to see what I have, here is what I came up with – Orange, Celery and Beetroot Salad with Feta and Black Olives. 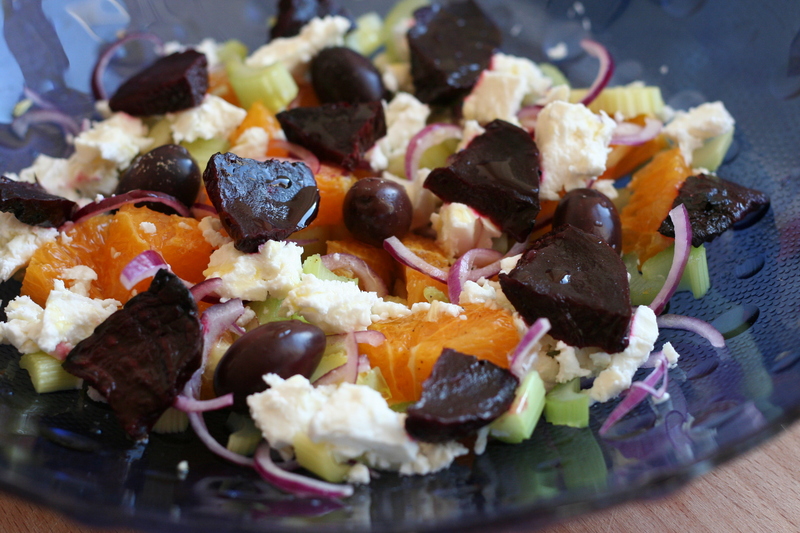 The combination of the tangy orange with the earthy beetroot and saltiness of the feta and olives works well. The celery adds freshness and crunch. I have tried to give amounts as a guide but you may find, as you go along, that you want to add more or less of one or two of the ingredients. Peel the orange and remove the white pith with a sharp knife. Cut into small pieces. Slice the celery into lengths of about half an inch. Cut the beetroot into eighths. Assemble the salad just before serving. Place the pieces of orange in the bottom of a shallow bowl or flat serving dish, then, layer by layer, add the celery the olives, red onion and feta. Don’t mix. Add the beetroot being careful not to place it near the feta or it will bleed into it. Finish with a squeeze of lemon juice and a drizzle of oil. Because of the saltiness of the feta and the olives, the salad should not need any salt. This will serve two as an accompaniment or one for lunch. Do you like or loathe celery?